After a few adjustments and a list of weathering suggestions to address ... I was approved! 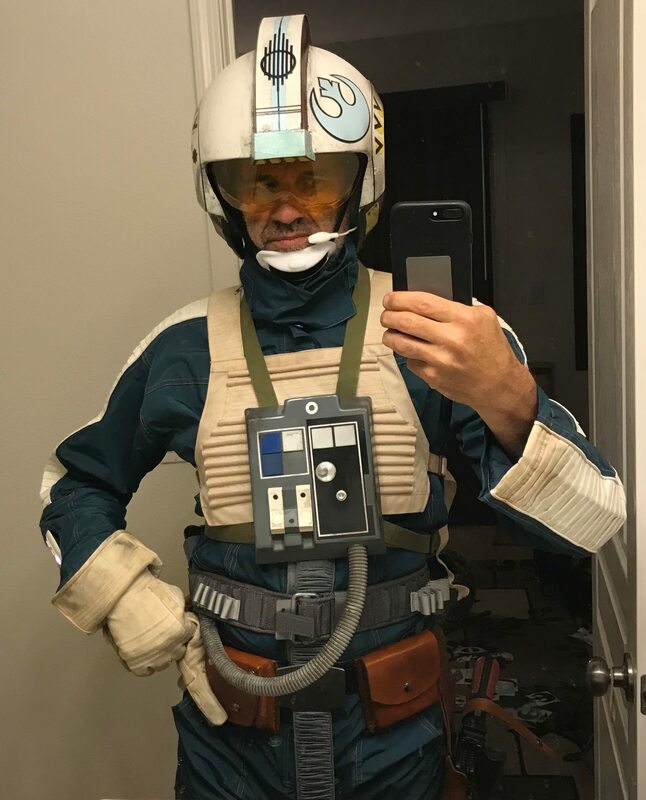 I'm finally going to jump in front of the firing squad and see how close I am to approval for my Blue Squadron X-wing Pilot build. 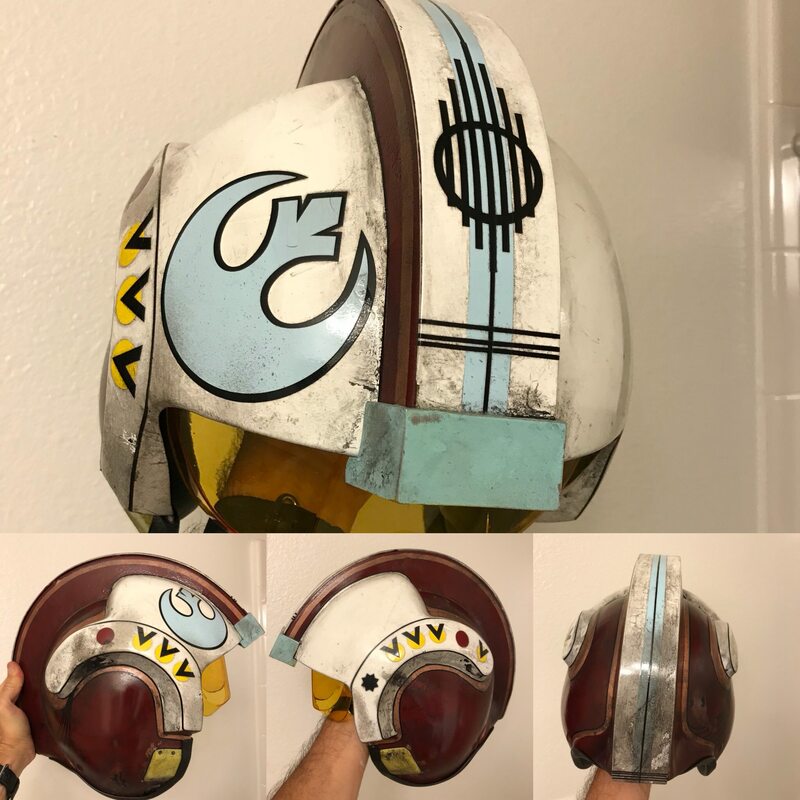 I just finished building and painting my helmet. 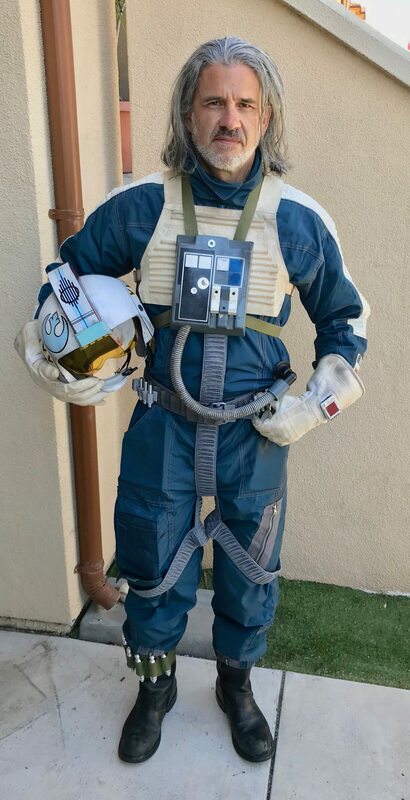 I was building my suit when Imperial Boots came out with the Blue Squadron Kit. I jumped on the chance and avoided testing out my limited sewing skills. Looking good. Nice job on the helmet. Is the suit really as teal as it looks in your pictures? It should be more of a blue-green and have a sheen to it. But it could just be the lighting in the pictures. The belt flare loops will need to be trimmed down a bit, they look really big (i.e. long and loose). And I assume that the glove can be tightened? It shouldn't fall down your arm. Thanks for the notes. I really appreciate it. The lighting is a problem with the indoor photos. I wanted to do some outdoor pics but it was really hot outside. And the belt loops in this photo don't look as wide. Ah, yeah, the belt flare loops do look fine with the flares in them. Nevermind! Does Imperial Boots sell the gloves as well, or are those from somewhere else? 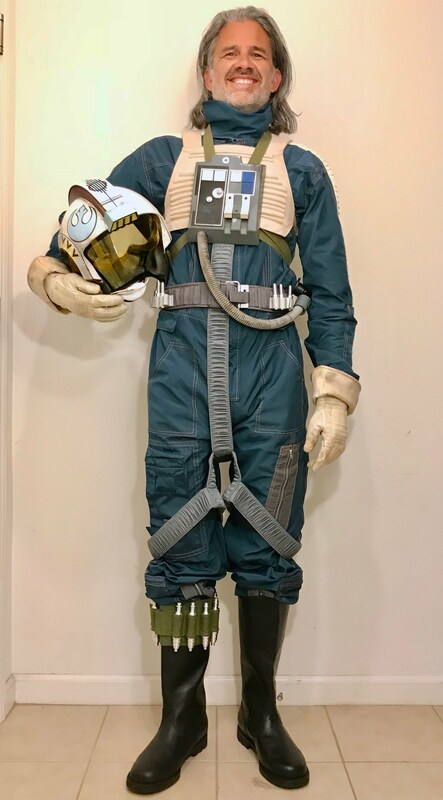 The collar on the flight suit really stands out to me as inaccurate but the rest is looking great. I'm having some issues with the collar and how stiff it is. They actually added a hood inside of the zipper. I may have to alter it so it sits right. Some of my reference photos make the collar seem very tall and others may it look squished. Since I'm not going for Gen Merrick, I'm looking at all the variations of the suit in the photos in order to find a strong reference. I've made a few adjustments. 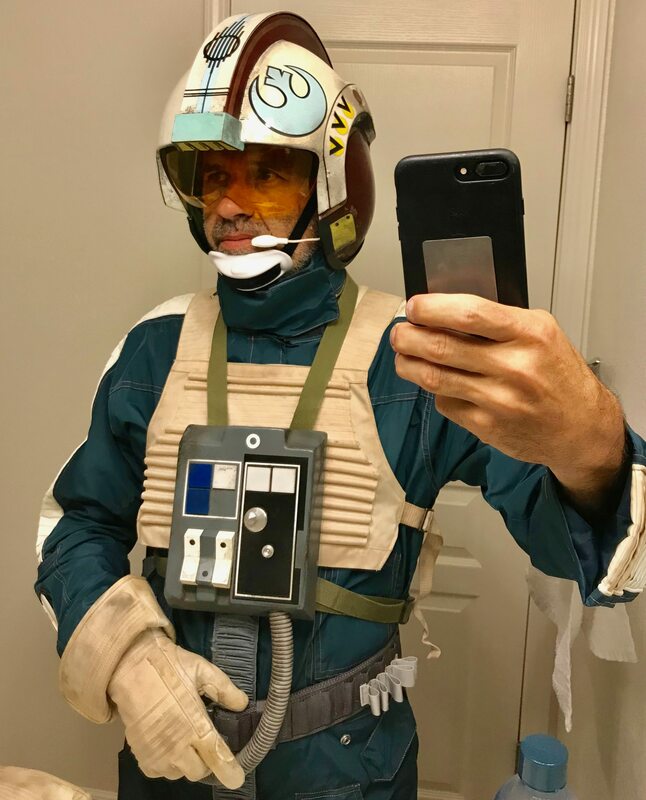 I took the velcro off the collar and added snaps. I also dug up my old motorcycle boots that have a nice measure of wear and tear on them. I've continued to weather the parts and have some more work to do. The Flack vest was long and sat a bit low so I did some adjustments in order for it to sit higher up. I inserted some foam in the pockets to give them a look of "use"
Im still working on the hose attachment. Currently is a magnet but the hose pulls the connection out and looks crummy to me. I've sent my application and I hope to get a response soon. 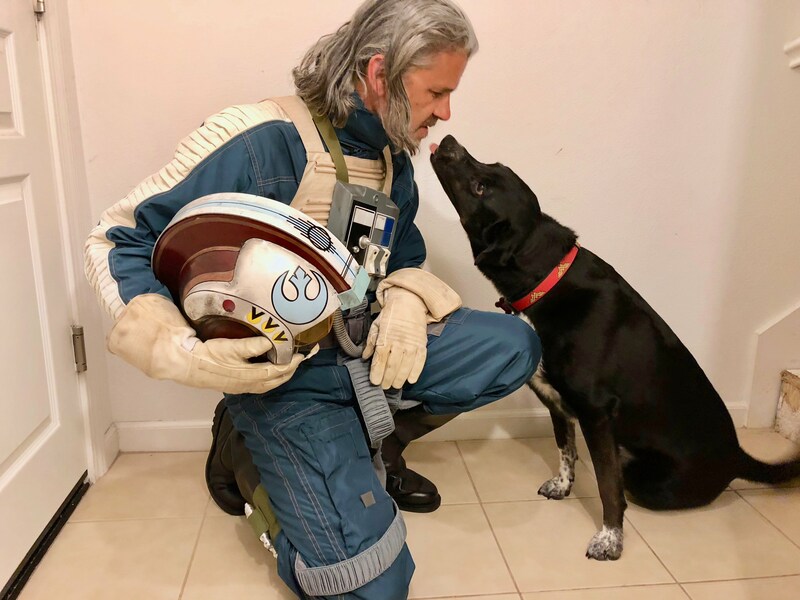 I could see you as an X-Wing pilot in the movie. You got that seasoned veteran look. how did you make the side stripes?